Franklin Mills offers the most comprehensive line of patient charting products available. Our line includes a complete selection of molded ring binders, chart holders, chart racks, clipboards, made-to-order chart dividers and chart accessories. Contact the experts at Franklin Mills to discuss your next charting project at 1-888-678-4585. Our medical grade binders are designed to meet the needs of today's most demanding nursing environment. Franklin Mills molded ring binders feature a tri-polymer molded process for extra strength and durability. Strong rings, smooth edges and the twin hinge system assure years of continuous opening and closing. 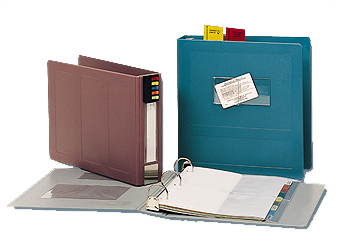 Our molded ring binders are available in 1", 1.5, 2" and 2.5" inch capacity (open side and top open styles). All of our binders are backed by a five year guarantee. 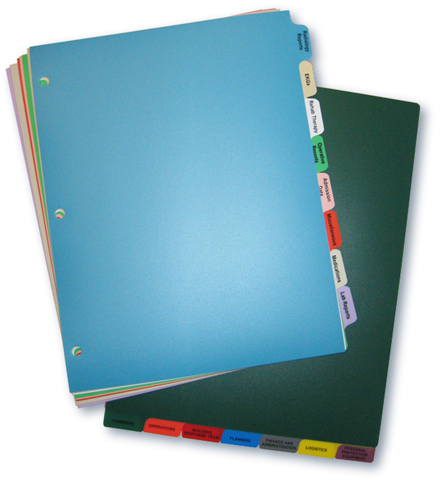 Franklin Mills offers a comprehensive line of poly chart dividers for managing patient medical records. Our durable poly dividers are built to last. We offer several standard chart divider sets - in stock and ready for shipment. Franklin Mills offers complete custom printing and specification of our poly dividers for optimal organization and management of patient care information. Our mobile chart racks carts are designed specifically for patient charting systems. Our carts provide organization and protection against ring binder wear & tear. Optional locking panels help maintain patient and resident medical record confidentiality. Contact the charting experts at Franklin Mills for personal assistance in determining the best charting solutions for your medical facility. Click here to view our mobile chart racks brochure.